British Prime Minister Theresa May said she cried a "little tear" when an exit poll revealed she had failed to win an overall majority in a June 8 snap election. Theresa May, pictured in today's interview, said she was devastated at the election result and that her husband Philip gave her a hug after breaking the news of the shock exit poll to her. May told BBC radio she felt "devastated" when the results came in, revealing she had lost her parliamentary majority, despite her call on Britons to give her a strong mandate to negotiate Britain's exit from the European Union. 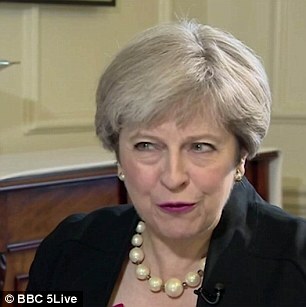 May said her campaign was not "perfect", but said she expected that her party would increase its majority. The prime minister said her husband Philip told her the result of the exit poll and gave her a hug to console her. "When the result came through it was complete shock," May said. "It took a few minutes for it to sink in what it was telling me." May faced calls to quit from inside and outside her ruling Conservative Party after losing its majority in an election she did not need to call and which plunged Britain into the worst political instability for decades. "When it came to the actual result there were a lot of people within the party who had been very close to the campaign who were genuinely shocked by the result as it came through," she said. May said she had not considered stepping down and declined to say how much longer she would remain in power. "I still see there is a lot that we need to do, and as prime minister I want to get on with that job of changing people's lives for the better," she said.